As a martial arts instructor, I’ve heard many students say they hope having a black belt will look good on their college applications. (Equally often, I’ve heard kids or parents say a student can’t come to class because of all the other activities they’re pursuing for their college applications!) Of course, “putting it on the resume” is a poor reason to train for black belt. At the same time, the personal qualities forged in the process of earning that belt can be good indicators of college success. Is martial arts training considered a good extracurricular activity to have on one’s application? Do some admissions officers look down on it as “violent”? The UC Berkeley admissions office views the martial arts as an excellent extracurricular activity. Martial arts training is not regarded as violent by our admissions officers and we are aware that martial arts training is both an excellent physical activity and that training can improve academic performance (according to our applicants). There are several martial arts clubs on campus including Judo, Tae Kwon Do, and Wushu. Additionally, martial arts training offered as a recreational activity for students, faculty and staff. For more information about our martial arts programs, please visit http://recsports.berkeley.edu/sports/martial-arts/. How much do admissions officers know or find out about different martial arts, or different degrees of black belt? As with many extracurricular activities, clubs, and competitions, we learn about martial arts training and achievements from the applicant. The applicant should assume that the application reader knows nothing about their martial arts training. It is their responsibility to impart detailed information about their training and the level of their achievements. Just as academics will vary from applicant to applicant, individual extracurricular activities such as martial arts training will vary as well. The level of detail one provides about their martial arts training and achievements will help make their case for admission. Does it count for more if I’m in a martial art that emphasizes sport competition? Does it help if I’ve won a lot of championships? Not necessarily—many applicants may not have access to competitions or simply choose not to compete for a variety of reasons. Competing can add value to an application but so can leadership roles such as instructing, serving as a role model in your community, or service to others. I’ve heard I should have lots of different extracurricular activities on my application to make it look better. I have so many different activities, I can’t practice martial arts as often as I want – but I want my application to look good. Am I doing the right thing, piling on activities? We see a variety of applicants including those who are involved in many different activities to those who are dedicated to one activity. For UC Berkeley, the quality of the program or activity is a key factor in the admission process and will significantly influence the application review. A student who piles on activities or simply participates in a variety of activities radically differs from one who dedicates a significant amount of time to their activity and has earned a high level of achievement within their sport, club, or volunteer work. If an applicant dedicates themselves solely to one activity, it is important that they understand how to convey their dedication to the application reader. I often see martial arts applicants break down their martial arts training into several components. If they are an instructor at their dojo, they list these hours as a volunteer activity or work (if paid for their instruction). Their martial arts training is listed as the primary activity and the hours dedicated to their training should be listed here—applicants should remember to include the time spent outside the dojo conditioning and practicing. Achieving the rank of black belt is an honor; this and other related achievements could be listed as honors or awards. Martial arts training camps a student has attended could be listed under special program participation. Applicants should use the college application to their advantage—especially the essays or personal statements to provide in-depth information about their training. There are so many young people doing martial arts and earning black belts as kids or teens. How can I make my achievement stand out from the crowd? Every applicant is unique and so are their individual life experiences. Applicants can make their achievements stand out from the crowd through their essays or personal statements. I find it especially helpful when an applicant talks about challenges they have faced in their training or opportunities that have arisen as a result of their training. What is their response to these challenges and/or opportunities? How does the applicant apply their martial arts training off the mat and outside the dojo? Can you give some examples of what an admissions officer likes to see/doesn’t like to see? 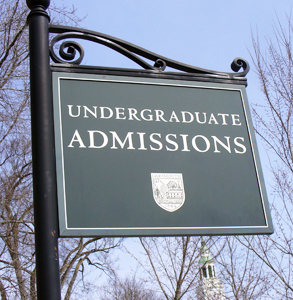 The college applicant pool is as diverse as the criteria by which a school reviews and selects students. I advise students contact individual colleges and universities to learn about their review and selection process. For UC Berkeley, each applicant starts from a neutral standpoint and our admissions officers look for items within the application that add value to one’s application. We like to see students who go above and beyond minimum requirements in academic or personal achievement. We do not penalize an applicant if critical information is missing or if they missed an opportunity to convey information in their personal statements. These applications simply remain at a neutral standpoint. We make the best possible case for admission to our school based on the information an applicant provides in their application. Without revealing anything confidential, are there any good “martial arts applicant stories” you can tell? There are so many who come to mind but the following two examples did a fine job presenting crucial information in their application and personal statements. There first was an applicant who was competing at an international level in Tae Kwon Do. Their application stood out because of the level of detail provided regarding their achievements, training, and competitions. The student used the extra-curricular page of the UC application to their advantage by using key words or phrases to describe an honor, award, or competition. Furthermore, the applicant informed us that they often completed school assignments and papers on the plane or in a hotel room. We learned that they were an independent student, self-sufficient, and demonstrated impeccable time management skills required to succeed in both their martial art and in school. Another applicant that stood out was 3rd degree black belt who achieved this rank by the age of 17. This applicant was an assistant instructor who helped manage the dojo but never competed for personal reasons. This young person took on a high level of responsibility for the students within the dojo and community as well as maintaining a high level of academic achievement within the school. Their application provided details regarding time spent training, instructing, managing the dojo, as well as time spent conditioning and practicing outside the dojo. Thanks, Stephanie Bertagnole, for sharing your advice and expertise with the Kids’ Karate Workbook blog. And good luck to this year’s young martial artists applying to U.C. !